While fans were still reeling from the events of Day 2, Disney Interactive took to the D23 Expo stage to reveal the company’s plans for the video game franchises under their belt. A big announcement was made for the upcoming Kingdom Hearts 3, but it was Star Wars that definitely brought the house down. 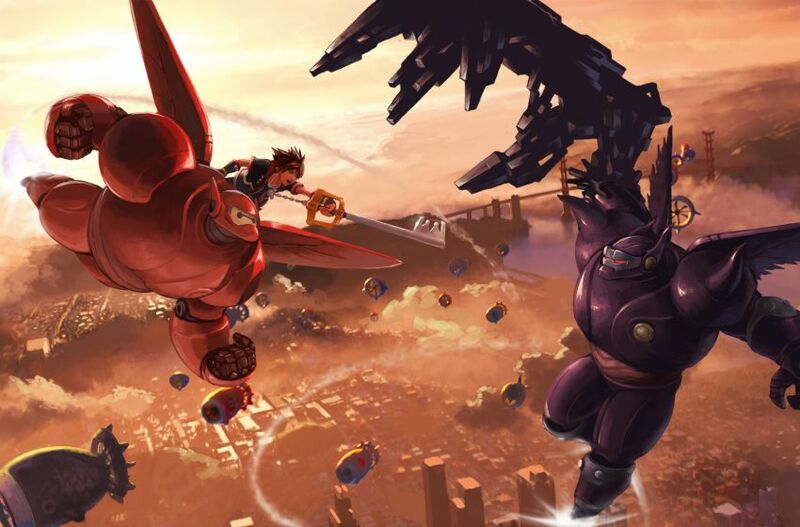 While we didn’t get a new trailer for the Disney/Square Enix smashup, we were treated to a brand-new announcement: the cast of Big Hero 6 and San Fransokyo will be in Kingdom Hearts 3. Executive Producer Shinji Hashimoto and Walt Disney Animation Studios Producer Roy Coli pitched in to make the announcement, the latter stating that the themes from both franchises mesh very well. Disney’s presentation continued with a slew of Star Wars announcements. The panel had actors Daisy Ridley and John Boyega from The Force Awakens to announce the upcoming Disney Infinity 3.0, which includes Rey and Finn from the film. SVP and General Manager of Disney Infinity John Blackburn teased that Finn has the “most powerful” weapon in the new expansion, which goes out on August 30. Also teased for the game was the Marvel Battlegrounds Play Set. Infinity wasn’t the only game to get a Star Wars announcement as Star Wars: Battlefront also got a footage showcase, along with the reveal that it would be bundled with a Darth Vader-styled PlayStation 4 this holiday. Art for the game showed X-Wings and TIE Fighters locked in a dogfight. EA’s Justin McCully, who is overseeing development of Star Wars titles for the company also revealed artwork for a DLC mission for Battlefront. Said DLC is centered on the Force Awakens, and shows partially destroyed Imperial starships and a battle-scarred landscape. Do You Wanna Build a Theme Park? Disney Magic Kingdoms, a mobile game currently in development from Disney Interactive, was also announced. The game will allow players to create their own Disney Theme Park, with a little help from friends. Footage showcased Mickey Mouse running out of Sleeping Beauty’s castle just as Maleficent takes it over. It will apparently be driven by a story involving some of Disney’s most infamous villains, which players will need to unravel as they play through the game. The strong show from the panel may mean more reveals soon, as more information is expected at both the Penny Arcade Expo towards the end of the month, and the Tokyo Game Show in September. ← D23: Disney confirms ‘STAR WARS’ Theme Parks!